Meditation Tauranga offers classes in Mindfulness Meditation, Chakra and Matra Meditation as well as Affirmation Meditation for beginners and ‘advanced’ meditators. It is owned and run by Sandra Saller, a German-born Banker, Teacher, Coach & Mentor, IT-Consultant and Project Manager, who moved to New Zealand in 2009, via Thailand, Laos, Vietnam and Cambodia. She has been living in Tauranga since then, became a Permanent Resident in 2010 and a Citizen in 2017. Sandra has successfully used various methods of focusing, mindfulness and visualisation in her sports career both as an athlete as well as a coach since 1981. In 2003 she started with Tai Chi and successfully finished her training and education as a Feng Shui Consultant, which she practises since then. In 2004 she added Reiki to her tools, which succeeded in completion as a Reiki Master / Teacher in 2007. Practising Meditation for years, and intensively since starting with Reiki, her Feng Shui and Reiki students asked her to meditate with them and teach them, which she did. This resulted in an increasing number of Meditation classes, along with the Feng Shui and Reiki Workshops she provided and facilitated. In 2006 Sandra also started as an apprentice in Traditional Chinese Medicine, which was only logical, coming from the 5-Element-Theory in Feng Shui. These gave her new insights into her practise but never resulted in a degree. She also undertook classes in the matters of herbs, nutrition and kinesiology (touch for health). 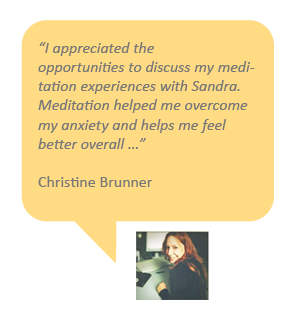 In 2008 Sandra specialised in Chakra work and developed a successful Chakra Workshop which combined Knowledge, Meditation and Exercise to stimulate and balance the body’s 7 main Chakras. These Workshops were well received and quite popular. 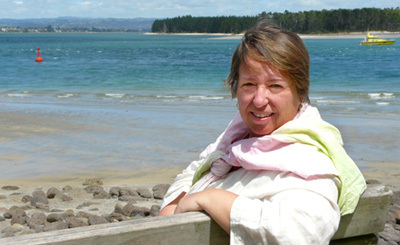 Since moving to Tauranga / New Zealand in 2009 Sandra has held various workshops and classes for Mindfulness and Chakra Meditation in Tauranga (Otumoetai and at the Mount), Hamilton and Auckland. She holds an NZQA qualified certificate in Nutritional Healthcare as well as Natural Healthcare (2012). She still has clients in Germany and other parts of the world, which consult her via Skype or Zoom. Enjoy the wonderful energy she has created in a lovely surrounding.